Ron Devito of US for Palin was in the Sistah Talk TV studio last Saturday as I sat on the panel to discuss Governor Palin. With his permission, I am publishing his full account of the experience. During the second week of December, Adrienne Ross emailed me about a “Governor Palin Project” she had. My interest piqued, and I inquired further. “Well, I’m going to be on a public access station in NYC, and they stream worldwide on the Internet,” Adrienne wrote. Each borough of New York City has a station, but “city” means Manhattan and only one public access station in the five boroughs live-streams. “Manhattan Neighborhood Network? (MNN)” I asked. Indeed it was. I’m familiar with MNN, because when I’m not working or doing doing my own Palin-related (Gov. Palin, family members, endorsed candidates) projects, I’m cutting videos for my wife’s ballet instruction show, Elsy Dance, And… which airs on Fridays at 1630 (4:30 PM) Eastern. Adrienne was to be on Sistah Talk, which airs at 1400 (2 PM) each Saturday. It worked out perfectly. I had to drop off a DVD of a re-run of Elsy Dance, And… anyway. 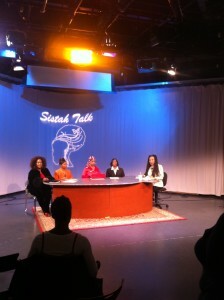 Sistah Talk is a talk show hosted by African-American women and it is oriented toward African-American-specific issues. Without Adrienne telling me anything, I already knew that the show’s hosts most likely bought into the identity politics of the Democratic Party. MNN has a sister building in Harlem, a solid Democrat area, and MNN being located on the Upper West Side, tends to run liberal. The hosts had been cajoling Adrienne to go on for months, but she was ambivalent about it. She did not want to do the show for reasons she couldn’t pin down. Finally, she agreed and Saturday, December 11 was the air date. My instinct told me that Adrienne was being para-trooped in behind enemy lines. And she was. In Sistah Talk TV Interviews Me about being Black and Pro-Palin, Adrienne provided her first-person account of the proceedings. 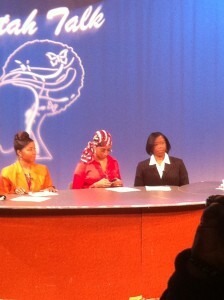 Sistah Talk is broadcast live from MNN’s headquarters, and I was to be in the studio audience presumably to comment. The first order of business was to drop my wife’s DVD off. The DVD clanged to the bottom of the drop-off box. That mission accomplished, I went to the right and into the studio. Adrienne was already there getting ready. I had not seen her since the Going Rogue signing in Rochester. Finally, the show went live. Almost immediately upon the utterance of the words “Sarah” and “Palin,” the anger and hatred began boiling up in Penwah, who was seated at the left-most side of the table. She started screaming that Adrienne was “ignorant,” “had been played,” “had not gotten off the plantation,” and “This is what is teaching our kids? God help them.” Adrienne took it all in stride like a professional. Of course, Adrienne is no stranger to controversy. She put her job on the line protesting the inclusion of Gov. Palin in a “Banned Books Week” display at her school. In Rochester, Adrienne had to mollify an angry crowd who learned they probably would not have their copies of Going Rogue signed. Ultimately, everyone’s books were signed. Later that night Adrienne was caught in an egg attack on a display stand featuring copies of Going Rogue. The egg attacker had targeted Gov. Palin, but was 15 minutes too late, because she had left the building. He ended up making restitution, buying the 10 books he damaged. Adrienne handled those situations with grace and poise. Following the show, the panelists and even an audience member who was not particularly fond of Gov. Palin complimented Adrienne on her professionalism and grace under fire. Penwah angrily demanded that Obama’s title should be uttered with his name. For my part, I will do it only under two circumstances: in quoted material from Gov. Palin or on a direct instruction from her or an instruction from a member of her staff that can be authentically traced as having originated from Gov. Palin. For her and only for her, I’ll do it. But, this was not the venue to express that opinion. I stayed silent. Penwah’s rage continued to boil. She huffed, puffed and fanned herself, strutting and fidgeting within her chair like a peacock. These actions may have been shtick, but her seething hatred was very real. Penwah was starting to look like a burning propane factory full of superheated tanks about to BLEVE (Boiling Liquid Expanding Vapor Explosion). The other panelists – though no fans of Gov. Palin by any means – at least backed their arguments against her with reasons. I found their reasons to be flawed, and flimsy, but at least Adrienne had a civilized conversation with these panelists. Reasonable people can disagree. But, there was no reasoning with Penwah, who was growing more enraged by the second. A few days later, Penwah was tagged in a photo with Adrienne. Penwah responded with a curse and threat-laden comment. At least her online personality is consistent with who she is in real life. After the show, my wife and I went to a party that my lawyer had invited us to. He was a delegate on the floor of the 2008 RNC convention and saw Gov. Palin’s speech live. At the party, he introduced me to someone who he thought would be a good supporter of Gov. Palin’s. Those who know me, know that my wife is rather liberal. When she expressed her view, this man literally exploded. “Obama, Clinton, all of them should be hung [sic]!” “I don’t know how you could be married to her! I’d have killed and buried her by now,” he said about my wife. About the illegal immigrants, he said, “send them all home in body bags!” About Gov. Palin, he said, “if she gets nominated, we have another four years of Obama.” So much for that “good supporter of Gov. Palin” idea…. So, how could I stay married to my wife whose politics are diametrically opposed to mine? Simple. Love transcends politics. I’ve been with women whose politics were the same as mine. And, I’ve been married for 14 years (this December 23). The African-American raging woman that was Penwah and the Caucasian raging “Tea Partier” that was this unnamed man to me were the same person in spirit. Their hate and their extremism brought them to the same place. Hate is hate. Indeed, I remember one of my teachers telling me that extreme rightism and extreme leftism are curves on the circle that both lead to tyranny and dictatorship. On Saturday, many people were writing about Governor Palin’s introduction to the nation. Bloggers–myself included–were recording what they remember about that day or their favorite Palin moment since that day. Here in New York, we wanted to do that, but we wanted to do more. We created an opportunity to get together with other Palinistas to connect, strategize, and, of course, give in to the nostalgia. New York City was the location. It was too far for some in our New York network to travel, so we had a small group–four of us. I drove the five hours round trip, and it was well worth it. Though small in number, this was a strong and diverse group, capable of great achievements in the pro-Sarah, pro-America, pro-conservative movement. In attendance were Pamela Geller (Atlas Shrugs), Raj Rajagopalan, Ron Devito, and yours truly. You know Pamela from the prestigious blog, Atlas Shrugs. She is a powerful writer, public speaker, and activist who believes deeply in what she writes and speaks about. She is fired up and passionate about America and wants to see us progress in the right direction. Ron Devito is another loyal Palin activist and blogger. He is the editor/publisher of Alaska Governor Sarah Palin’s Accomplishments, for which I also write. He oversees several contributors to his blog that is committed to publishing the accomplishments of Governor Palin–accomplishments that are ignored or watered down by the mainstream media. As the four of us talked in the restaurant, we noticed other diners paying attention to our conversation. As you know, New York is not the most conservative of places, so that’s to be expected, I suppose. Raj’s T-shirt didn’t help matters either! After our meal, we went to an apartment where we watched last year’s Dayton, Ohio speech that Palin made after John McCain introduced her to the nation. One would have thought it was a year earlier and we were in the crowd in Ohio, for we, too, sat on the edge of our seats and clapped our hands while watching the year-old video. Before we ended our time together, we discussed alternate avenues to get our message out. Here’s some breaking news for you: we cannot rely on the mainstream media! Therefore, it is of the utmost importance that we create our own media. With some tips from Pamela, I am now hoping to expand my influence and continue to get the truth out there in varied ways. Some might say, “Why? Palin is no longer the governor of Alaska or the vice presidential candidate.” True. However, she is not fading into the distance. She continues to be a voice, and that voice continues to get distorted by an agenda-laden media. So the question is: what do we do about it? That’s where people like us come in. When necessary, we must be committed to going around the CNN’s and MSNBC’s of this world, the Katie Courics and Charlie Gibsons, and using other tools: written blogs, video blogs, online newsletters, and social networking sites. This is grassroots at its best. As my readers know, I am the New York State Organizer and Media Director/Spokesperson for the 2012 Draft Sarah Committee. My prediction is we will see Governor Palin become President Palin in the next presidential election. However, whatever road she decides to travel, it will take people like us–people like you–to help her navigate safely, for we know the Left will continue to throw every rock at her that they can manage to pick up from the side of the road. This is why it’s important that we get together with others who are like-minded, those who are committed to truth and have an aversion for smears and destructive tactics. The time is now. This is the time to be–not just Pro-Sarah– but pro-active. In case you can’t see it, what’s printed underneath Palin’s pic on Raj’s T-shirt is the phrase,”Go get the socialist!” Needless to say, he got stared down on the train and in the restaurant!